Charlene Delaney’s stellar team is focused on one thing: Your Success! Meet Charlene’s team and see what a difference it will make on your transaction. Prior to moving to San Francisco, Jerre was in the legal arena as the Court Coordinator for the oldest felony court in Dallas for eight years and then served as the Coordinator for the Strategic Planning Task Force for the Dallas County Juvenile Department. 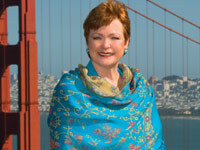 After relocating to San Francisco she served JAMS (Judicial Arbitration and Mediation Services) as Operations Manager and then became National Operations Manager for AMFS (American Medical Forensics Specialists). In 2002 it was time to take up a new direction and plunge into a long dormant dream of becoming a Realtor®. Jerre joined Keller Williams in San Francisco as a licensed agent and represented buyers and sellers in San Francisco and the Bay Area for seven years. From November 2009 through April 2013 she was chosen to lead and manage two different nationally recognized estate offices in San Francisco. In May 2013 Jerre rejoined Charlene as the Delaney Team Director and works with buyers and sellers in San Francisco and Marin County. Her motto is “Your Dreams, My Passion!” Her many clients since 2002 would agree. 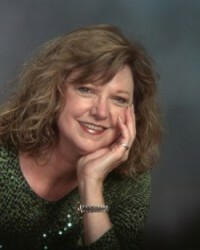 Tiffany joined the Delaney Real Estate team in early 2010. She has been a licensed real estate agent since 2004 and sold homes as a Keller Williams agent in 2009. She currently handles all aspects of marketing for the team including email/digital, print, website administration and more. She is also the team's transaction coordinator and works closely with Charlene to get to close of escrow. 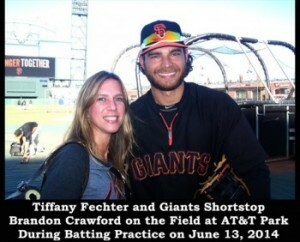 You can see by Tiffany's photo that she is a big Giants fan and had the pleasure of meeting Brandon Crawford (pictured here) along with Bruce Bochy, Angel Pagan and Gregor Blanco at on-field batting practice at the Giants' game on June 13, 2014.